British rock legends MAGNUM have confirmed their return to Ireland with a date at The Limelight, Belfast on Friday 27 May 2016, the bands’ first in over 25 years on these shores. Tickets are on sale now from all usual Ticketmaster outlets and Katy’s Bar, Belfast. Their brand new studio album titled ‘Sacred Blood “Devine” Lies’ is released worldwide on February 26th 2016. For a musician like Tony Clarkin who composes constantly, viewing and selecting the material he has written is always one of the most significant moments during the creation process of a new Magnum album. On the one hand it’s a luxury to have the opportunity to separate the wheat from the chaff and to be in a position to use only the strongest numbers. On the other hand it’s also a difficult process, because after all the creator of those songs has grown fond of every single one of them. I usually start composing for our next album immediately after the release of the previous one, Clarkin explains. Clarkin is referring mainly to the title track and opener of the new album. I feel that Bob delivered it really well, Clarkin praises his vocalist Bob Catley. As far as I am concerned, ´Sacred Blood "Devine" Lies` is definitely likely to join the ranks of great Magnum classics. So it comes as no surprise that ´Sacred Blood "Divine" Lies` with its significant message became the album title. So here it is: Sacred Blood "Divine" Lies has been scheduled for release by Steamhammer/SPV on 26 February 2016 and will – you don’t need to be a clairvoyant to predict this – be loved by the bands’ fans. That Clarkin will probably already have his mind on Magnums’ next release by that time – well, that’s another story. 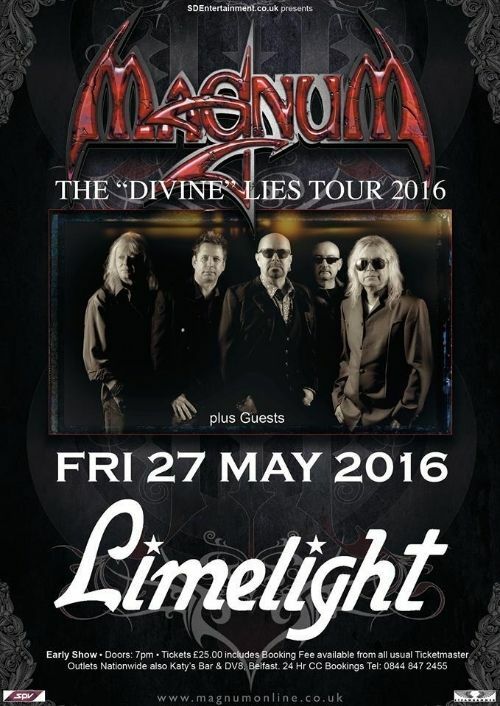 Magnum plus guests – Limelight 1, Belfast – Friday 27 May. Doors: 7pm – Early Show. Tickets on sale now from www.ticketmaster.ie and all usual outlets including Katy’s Bar & DV8, Belfast. 24 Hr CC Bookings on 0844 847 2455.